During our visit in California Zach took his driving permit test and he is now legal to drive under the supervision of a licensed driver. Watch out Kayo Zach is now on the road! 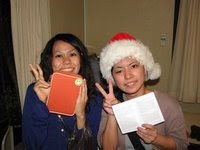 It is amazing, in Okinawa it cost the Japanese about $3,000.00 dollars to get their license. Here in the US, it cost only $27.00. Go figure! But to tell you the truth, Okinawan's are safe drivers, mostly because of the serious testing they have to go through to pass the test. Also, in Okinawa we drive an average of about 45 km per hour. That is about 30 mph on the local streets. 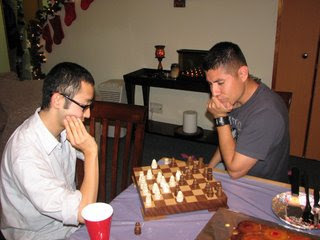 After Christmas Pastor Jerry had a leadership dinner at the Escalantes' home. It was such a blessing to be together for this event. After the food Jerry encouraged us in the Word, and then we spent some time praying with each other. Robert and Anna are wonderful hosts. This is one scary picture bro. 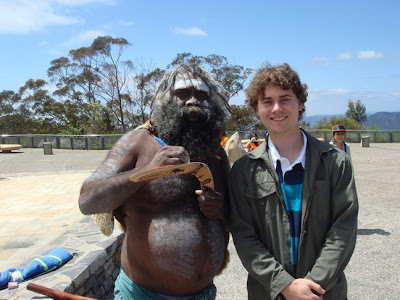 Tom is standing next to an Aborigine from down under his name is "Goomblar". Look how young Tom looks with that clean shavin' face. 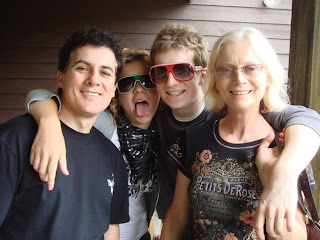 In the upper picture is Tom's family, starting from left to right; father (Damien), older sister(Trinity), younger brother (Ben) and mother (Kerrie). 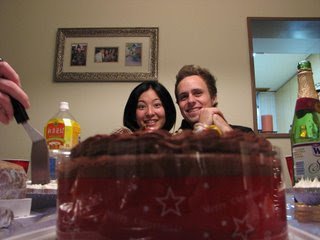 The best thing of all, Tom stated that he will be coming back to Okinawa in late January! Praise the Lord! We are so blessed and totally look forward to seeing you again soon. This morning we gathered at Pastor Tom's place (he and his family are in the States but he opened his home to us anyways), and had a delicious breakfast potluck and gift exchange. It was PACKED. I think the total, including baby, was 38 people! After a lot of people left (sorry guys) I pulled out my chocolate fondue set and we ate fruits the fattening way! I'm glad Jesus has a birthday once a year just like the rest of us... not just because we can gather and fellowship, but because it reminds us of the miracle of His birth, and of course the subsequent perfect life, sacrifice, and resurrection! Thanks, Lord! Merry Christmas to all! Last night the winds were blowing so hard (Santa Ana Winds) but by mid afternoon they died down and the weather was very comfortable. We are staying with Pastor Tom's Parents in Norco. It was a blessing to open up our presents and enjoy our time together with family. Later in the afternoon Pastor Gil Garcia from Bakersfield stopped by and also Segmon Joyce joined us for a late lunch with pie dessert. We were totally blessed. We hope that everyone had a Merry Christmas, and may you have a Happy New Year! Christmas Mexican style. 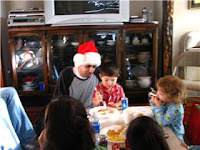 No, Sosimo didn't come back to Oki for Christmas... I was invited over to my friends' place for dinner and good times. 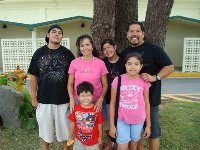 The Barrios family have been in Oki for over a year now, and they are a lot of fun to spend time with and be chased by their kids. Julia, Alondra, and especially Nico are so much FUN! 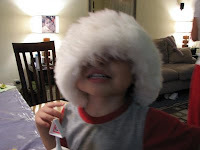 Here's a pic of Nico wearing my Santa hat. Also included are pics of Yoshi beating Dave (Barrios) down at chess, a pic of Ayu and Tim appearing from behind a cake, and one of a bunch of people sitting around while Tim laughs. Last night we gathered as always at the Koinonia Cafe. 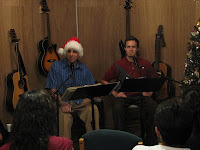 Instead of continuing through (and finishing) the book of Job, we had a special Christmas service. 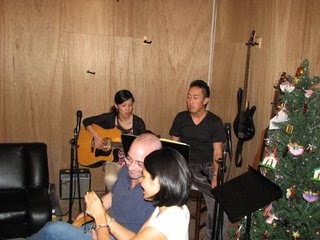 Andrew and Dan led us in worship and Christmas songs, and some guy named Trevor gave the message in Japanese. Pastor Tim translated into English for the non-Japanese folks. 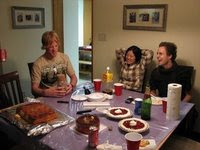 Afterwards we had a dessert potluck. To the best of my knowledge there were no confessions of faith, but I know there were some non-believers who came, heard about the miracle of Jesus' birth, and experienced God's love and Word in a powerful way. It was an amazing night! This is the official video from the Youth Winter Retreat at Green Valley Lake. The youth from CCLivingwater and the surrounding Calvary's had a great time. We hope that you like the video. Just double click on it and be blessed. These are so old pictures, way back in the CCLW youth days. They did a lot together back then. The years make us change. But I have one question; in the center picture who is that sister to the right of Zach? We can never forget her name. For Christmas the kids at CCLivingwater put on a play for the body and community in Corona. They did such a good job. It was awesome! The kids were number one! They intergrated video as well as a live performance. Jesse Hernandez did a good job in sharing the Word of God. Life in the youth group began fast. As a little guy he was always hangin around the church. But now he is a full time Bible College Student. Keep up the good work guy, and stay focused on the Call of God in your life. Well, this guy hasn't changed much. He still looks like Daniel but clean shav'in. The youth group has never been the same without him. Who is this young guy. This is Pastor Tim as a youth group leader/student. Look at that hair! We went way back in the archives to find this stuff. Thanks a lot Jonathan for the pictures. It is always a blessing to minister at the Spanish Ministry at Livingwater. The Spanish body gathers together on Sunday mornings and Wednesday evenings. Pastor Cisco has been teaching faithfully for some time now. It was a blessed morning. 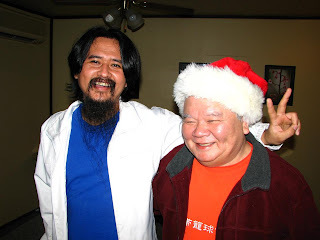 John Hasagawa who is one of the leaders at CCCostaMesa's Japanese fellowship, invited some of the Bible College Students to their Christmas Party which was held at his house. 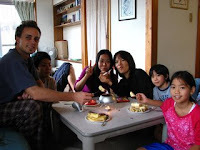 Some of you might remember Johnsan, he visited with us in Okinawa. He is also presently enrolled in the School of Ministry at Costa Mesa, he is finishing up his Master's program. 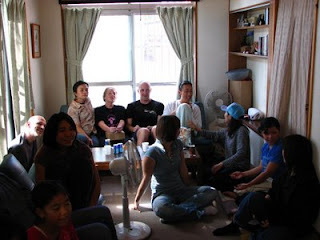 It was such a blessed to be with our brothers and sisters here at the Japanese fellowship, we felt right at home.